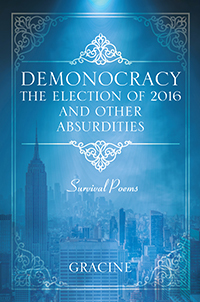 This is a work of topical and satirical poetry, focusing on current events and familial oddities. Gracine grew up in a diverse community on the lower east side of Manhattan until she moved to Long Island. There she married and raised four children. She received a BA in English and an MA in Social Science from Hofstra University. She taught secondary and college English for over three decades. From a very young age, Gracine was inspired to become a political activist; she was always aware of the injustice she saw around her. While a student at Jamaica High School in Queens, NY at the age of 15, she became active in the National Conference of Christians and Jews, which championed all minorities and stressed the commonalities among human beings. She became a counselor to underprivileged children throughout high school and college. Throughout her life she continued the struggle for civil rights for minority groups and equal rights for women. She has been a professional singer, performer and poet. Gracine is also a Jeopardy champion! !